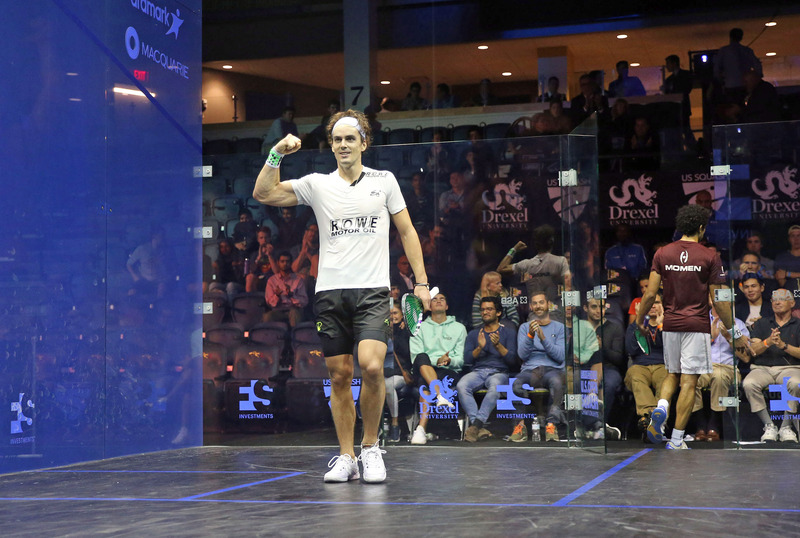 New Zealand’s World No.8 Paul Coll became the first male Kiwi since the 1990s to reach the semi-finals of a major PSA Tour event after he claimed a massive 3-2 win over World No.3 Tarek Momen at the FS Investments U.S. Open Squash Championships, PSA World Tour Platinum event. The pair played out a gladiatorial 96-minute battle at Philadelphia’s Drexel University which saw some punishing rallies put both players through their paces as Coll twice recovered from a game down to set up a decider. With the drama reaching a crescendo inside the Daskalakis Athletic Center, Coll and Momen both squandered match balls until a no let was given against Momen on the second of Coll’s match balls. That sent the player from New Zealand through to the semi-finals of this tournament for the first time, with Coll winning by a 6-11, 11-8, 5-11, 11-7, 13-11 scoreline. “It feels amazing,” said Coll. 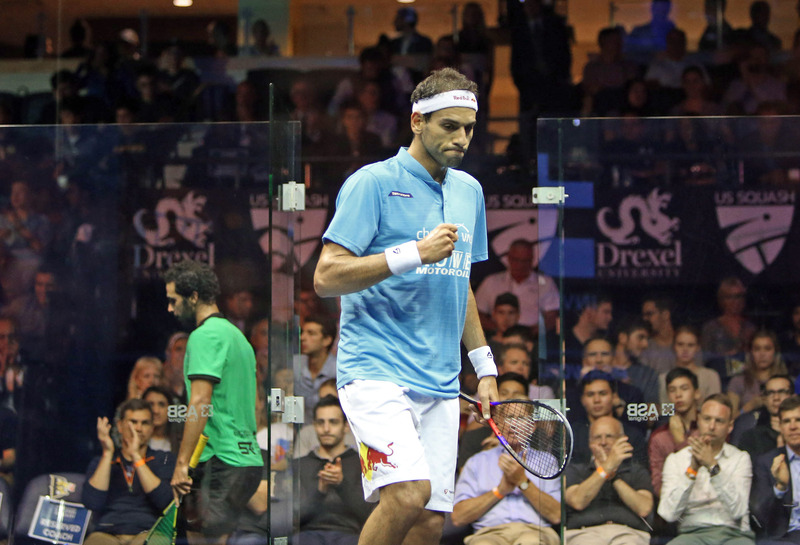 “Tarek is a great player and he’s so fast, but I felt that I really found my game more in the fourth and fifth. There were a few edgy shots in the fifth, but I got a $300 parking fine earlier today so that was a bit of extra motivation to pay that off. Coll will take on World No.1 Mohamed ElShorbagy in the next round after he overcame World No.9 Mohamed Abouelghar in straight games to reach the semi-finals of this tournament for the fifth time in succession. Abouelghar had defeated 2016 World Champion Karim Abdel Gawad in clinical fashion in the previous round but found the tin with too much regularity against ElShorbagy, with the higher ranked Egyptian putting in a composed display and profiting off a series of errors from his opponent to book his place in the semi-finals. “He’s a great player but I just wanted to go on court with him today and I wanted to show him that how he won the last tournament [the China Open], he needed to do a 100 times better today,” ElShorbagy said. The 2016 women’s U.S. Open champion Serme will go head-to-head with World No.1 Nour El Sherbini in a repeat of that final after they claimed respective victories over United States No.2 Amanda Sobhy and World No.30 Yathreb Adel. Serme became the first female French player in history to win the U.S. Open when she beat El Sherbini in the final two years ago and the 29-year-old sent out a real statement of intent today as she hit her targets to perfection against Sobhy to emerge victorious by an 11-5, 11-8, 11-7 margin. “The crowd were cheering a lot for Amanda today,” said World No.4 Serme afterwards. 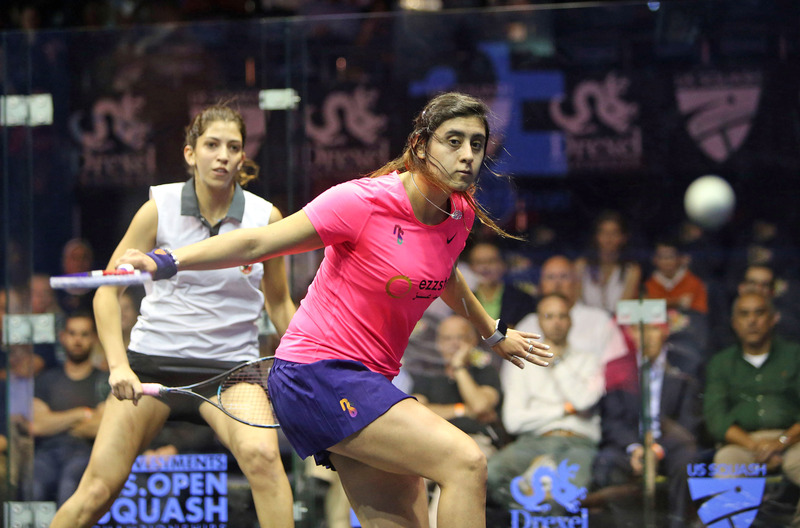 El Sherbini, who defeated Adel in straight games, leads the head-to-head record 10-8 against Serme, but the French player did end a four-match losing streak to the World No.1 in the semi-finals of last month’s J.P. Morgan China Open. The quarter-finals of the U.S. Open continue tomorrow (Thursday October 11) at 17:00 local time (GMT-4) and the action will be shown live on SQUASHTV (Rest of World) and Eurosport Player (Europe only). 2018 FS Investments U.S. Open Squash Championships, Drexel University, Philadelphis, USA.